Taiwan friend is right, It is very rare there are no defect found from a brand new player, one of the different between vinyl and CD is on the quality on the "weight", this player is doing good on this factor on keyboard reproduce. I think this is a well develop and all rounder cd player. I will try squeeze it more in my own system, I m in very interesting to know does it match well with cdm3 transport. Nosy Marvel went to listen to the split system this morning....the midrange to bass produce a very lyrical and organic listening pleasure! It has the tonality and at the same time the transient and attack!! The only shortcoming compared to Vekian is the continuous burst of energy in an orchestral type of music...Vekian has an edge in endlessly and effortlessly providing such continuous burst of power (like machine gun) while Neodio can do very single shot fast and punctual...I am floored by the combo inside and out...the make is also adopting constraint layer damping according to PT though slightly different application. I would not spend the time to tell you all the scores by attributes if my "gang" over here was not "floored" by it. It eclipses the Zanden 2000p/5000s by a wide margin, as musicality seems to be newly discovered from the same records over and over. The tonality resolution is not achieved by smoothness of the tube due to 2nd order harmonic resolution; hard to describe but I have to say this is very unique from a digital source. For symphonic scores, large theatrical opera and piano, the Vekian digital suite remains lonely at the pinnacle. Thanks Jeff...what about if I used Vekian transport to mate with the ND DAC, would it form a stronger contestant with the 'original' Vekian couple? What I listened in PT's place would certainly have some room for improvement if I change to use the AES/EBU FMR digital link between the ND combo instead of their 'stock' RCA digital link. The grandeur and authority of the orchestral music will certainly be more frightening...having said that, I would still cast the power supply built inside the Vekian DAC has an edge to produce the 'machine gun' type of bursts...do you agree? HOw many pieces of music that I listen most require 'machine gun'? Not a lot though. To me, AnalogDomain is the real gun tower which will rock my place in a few months' time!! 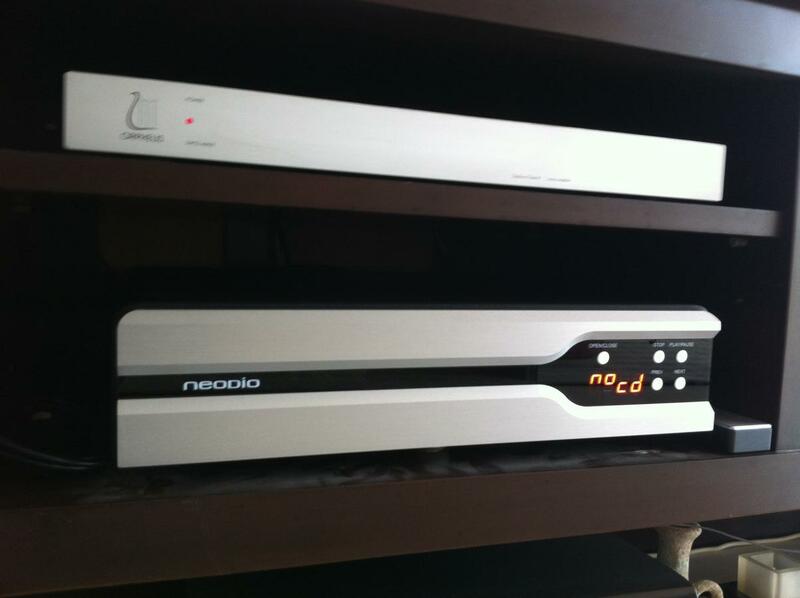 I read through the HiFi+ review on the CD player by NeoDio last night and I have to rectify my original thinking that whilst the DAC is really thinking out of the box in terms of the analog clocking mechanism, the CD transport may be the 'hidden treasure' adopting various technologies in vibration prevention using constrainted layering approach. Need more time to study and contrast with Vekian transport but doing the exact levelling on the transport should be the first and foremost step to ensure we are doing proper justice in evaluating this transport which I urged PT to double check on this point last night. You are right. Setting the level right of the CDT is paramount important because it is much more sensitive to leveling than all other CDT. It seems this NeoDio still grab your attention seriously even though you are using the Vekian suite. What makes it special? Mr.DV, did you buy the CD player or the CDT/DAC combo? i order the Dac first. waiting for delivery now. Vekian as a combo can do almost everything at a very high score, if I can use 100 as full marks, I think it scores an average of 95 (up to all the CD source that I have heard) with soundstaging, dynamic range, transient, speed, attack and transparency almost scoring full marks. It scores less high comparatively speaking on the midrange mellowness, 'elasticity', organic and naturalness although they are all above 90marks and few CD source can come close. A friend of mine who visited CES this year said he was mightily impressed by the NeoDio/Da Vinci room. Voy, are you getting ND? Do you think just the DAC would pair nicely with your Zanden 2000P? Just roughly read the review, i found there are only USB input. could clarify again what in/out put for coming dac? Also, there is a digital out, what is that? Thank you for introducing the NR22 player to me. It has wonderful tonality resolution. I was once an owner of Linn CD 12 (the 24 bit version). Musicality is usually associates with smoothness, but often at the expense of speed and transient responses. Another player that I had for a short while is the Esoteric flagship one box player. The highs are perky and the lower mid bass is lean, though the density of the mid-range is quite good. The magic of the NR22 stems from its ability to reveal the tonality resolution of different recording. I and my wife enjoyed so much about those canton pop recording in 70s/80s thru the NR22 because it really brought back the mood of the past. But the most interesting observation is it equally do well on modern recordings where frequency extensions are priorities. On such records, the Neodio is lightning fast when the tempo calls for it. Should I want to travel back in time playing Miles Davis with a glass of red wine, it send me back right there. I agree everything that was reviewed by Hi Fi plus.